Words, like molecules, are everywhere. They make up the bulk of our communication, yet we rarely ever notice them. How many times a day do you see the word "of"? Have you ever thought about what this two-letter word really means? By the time you finish this sentence, your eyes will have picked up the pattern of lines and spaces, sent a message to your brain to be decoded, and you will have arranged the information into a cohesive message, ending with this little dot. Within seconds, you will have transformed these little squiggles on the monitor into an understandable chunk of information. By the time you reach the end of the paragraph, you will have translated the message automatically, paying little attention to the process. Words are so ubiquitous, they are all but invisible. They are taken for granted. Yet, for a writer, they are the tools of the trade - which is why it bears mentioning what a word actually is. The dictionary definition for a word is: A sound or a combination of sounds, or its representation in writing or printing that symbolizes and communicates a meaning and may consist of a single morpheme or of a combination of morphemes; a unit of language that native speakers can identify; the blocks from which sentences are made. A word is essentially a symbol representing an idea or a state of being. The letters that make up a word are also symbols, but only represent the sounds necessary to pronounce a word - words exist independently of their spelling. Literacy, or even having a written language, is not necessary for communication through words. Therefore, the value of a word is not in its written form, but in the idea it represents. They say that a picture is worth a thousand words. Conversely, a word can contain a thousand pictures. 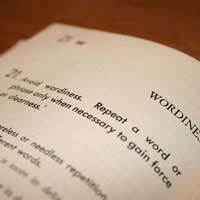 A word is a tiny package of information, which, when released, can invoke all manner of impressions. What comes to your mind when you contemplate the word "justice"? What is your gut response to the word "tiger"? What images appear when you think about the word "blue"? Words, like magical incantations, build bridges between one reality and another. They compress the environment, emotions, thoughts, and perceptions of one person (real or imagined) into a universal code. Used in this way, words are powerful - they can communicate a lifetime of experience in a short amount of space and time. They can also record permanently a thought, feeling, or command (such as in a written law). The drawback to this, of course, is that words can be interpreted quite differently than they were originally intended to be. How Can We Make the Most of Words? How does one make the most of words? Understand them. Whoever believes that words are cheap, most likely uses them indiscriminately. In fact, words are priceless, with the power to twist reality as much as represent it. If you are a writer, you cannot afford to underestimate the potency of words; in fact, you must learn how to cultivate them - by observing, pruning and nurturing them, and eventually harvesting their fruits. Know your tools. Enhance your skills by always keeping an ear out for new words and new usages. This applies to colloquial speech as much as academic terms. The greater your vocabulary, the more colours you will have on your palette. Paint a picture. Use words to evoke mood as well as convey information. The length of your words, the sound of the syllables, and the flow of the phrases all work together to bring a piece to life. Apply a deliberate method to the vision you want to create - are you aiming for a realistic portrait, or an impressionistic landscape? Every word counts. When writing, make sure that every sentence (and the words within them) has a purpose and can stand alone. Everything must serve to support the main idea (in nonfiction) or move the plot along (in fiction). Description must always relate to the other elements in a piece, otherwise it is rendered empty and superfluous. Less is more. Often a good idea can be obscured by too many words, like too many ingredients in a recipe. Leave space for your work to breathe. When in doubt, leave it out. Capture the essence. Writing is like hunting a beautiful, yet elusive butterfly. You must be agile, yet gentle, catching the meaning you want to convey without crushing it in the process. You must find the precise words in which to encapsulate your meaning, so that when they are read, its essence is released to the world, vibrant and alive, flying on its own wings.